Have you ever fished with one of these Ian Miller fishing rods? If you said no do yourself a favor and buy one of these beauties! You won’t regret it. You know whoever said fishing is like dating and that it’s all catch and release until you find a keeper was not far from being right. I have been fishing for life, and it’s one of the most therapeutic things anyone can do. I believe I speak for all fishing lovers when I say as much as my community loves to fish; we also love talking about it. Well, at least I love to talk about fishing. Let’s start with basics; successful fishing requires some essential gear. • Rod and Real – First of all Ian Miller Fishing Rods – One of the more unique fishing rods in the world is my go-to source when it comes to rods. I would say go simple and easy on your first fishing rod and reel as long as it can bait and lure fish. You can dive deeper into exploring the different types of rods used for different fishing styles when you get the hang of it. • Line – I get fascinated that of late, fishing lines are designed with various materials and diameters to give anglers more options. Who doesn’t like options and freedom to choose whatever works? • Tackle – The three types of tackles you need to think of are hooks, floats, and weights. This will all make sense if you stick around longer. • Bait or Lures – I use live baits like shiners and nightcrawlers to entice fish because I know that my target fish loves eating those. They work like a charm. Over time, I got bored with using baits only and spiced my catch by using lures. Maybe not bored, that’s not a word I like to use, but it reaches a time in fishing when all you want is a little challenge. • Tackle box – Golfers and tennis players have their small bags just like fishing enthusiasts. My tackle box carries all the gear I need for fishing thus increasing my mobility. • The kind of persons using it. • The type of fish to be caught. • Location of fishing: lake, ocean, fish pond or boat. In my other life, I tend to be a natural when it comes to mastering new things like I have aced fishing? In all my past knowledge, experience and glory, I can assure you that this natural superpower called fishing talent can fail you if you have the wrong gear. Regardless of where my fishing escapades take me, I try to find out the kind of fish dominating the water body of my choice. Having this knowledge is powerful. 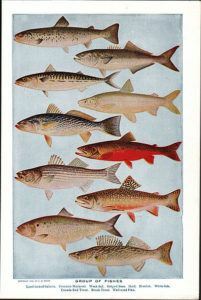 Knowing the type of fish, I am targeting priory helps in researching my chances of getting a good catch. 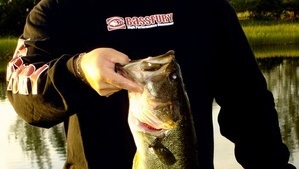 I research on the feeding habits of different fish and get to know which specific baits and lures are favorable. The research process includes finding out where particular target fish are in plenty and about the life cycle of different fish. Such nitty-gritty details always help me to score some pretty amazing catches. Okay, what happens now that I know the type of fish I would like to catch? The next step includes choosing the right fishing rod. Rod action is a term used to refer to how the rod behaves in different circumstances. How long is it? Does it flex a lot or a little? How long does it take after flexing to return to its original position? A lot of the rod action and power is determined by the type of material used to make the rod. Again, it comes down to the basics. I must know my target fish, and that knowledge places me in a better position to choose the rod with an appropriate rod taper and length to handle the fish. Owning a unique fishing rod comes down to the type of material used to design the rod. Ian Miller fishing rods, for instance, are my number one recommendation. The rods feature exquisite detail in their construction. Fortunately, materials for producing rods have diversified over time. They range from carbon, graphite, fiberglass and composite materials. The type of material used determines the overall rod action. I know that you can only scratch your back up to where you can. Money is another fundamental determiner of the kind of rod that you can get. I wanted to venture into fishing for life so badly that I saved for months only so that I could get a unique fishing rod. If you intend on fishing for the long-term, invest in a good rod once and for all. If you are in it for the short-term, then buy what you can afford or stick to hiring high-quality equipment. Ultra-Light Rods – These are short and light because they are designed for small fish. 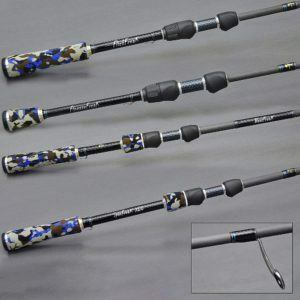 Spinning Rods – They are slightly technical to use and are the most preferred for sports fishing. Fly Rods – These are instrumental for fly fishing. Telescopic Rods – They are flexible enough to collapse the rod length on a shallow surface or extend the length into a deep surface. I find this rod ideal for surf fishing. Surf Rods – Largely used in sea fishing. They are long and robust enough to withstand heavy baits. Trolling Rods – They are used to fish in a moving boat. The motion of the boat sinks the bait in the water. Always remember that you get what you pay for. With Ian Miller fishing rods you’ll get a quality, unique fishing rod. Fishing is my go-to therapeutic activity. The better you treat and maintain your rod, the better it will perform in catching fish for you. If you have any questions feel free to leave them and I will respond. I used to do a lot of fishing with my dad when I was a kid. We would fish mostly bass using spinner lures. I’ve been meaning to get back into fishing and am currently looking for a new rod. These Ian Miller rods seem really nice. 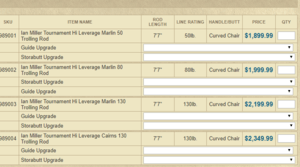 Which rod would you recommend for river fishing bass? Hi Eric, For Bass fishing on a river I would have to go with The Ian Miller SwimFreak Rod. This a U.S. Bass spinning rod that’s 7’8″ long. It’s multi-loading. Lure weight 1/2 ounce to 2 ounces and the braided line rating is 30-65lb making it an excellent rod for any size bass you can tackle in the field. Fishing is a really fun activity and it is something I really enjoy doing. Making use of the right gear when fishing is very important as it would allow you to have a better experience. I have never made use of the Ian Miller Fishing Rods and from your description it does seem that they would be really worth the purchase. This is some good stuff. I like the simplicity with which you introduced your article. It has sparked my interest in fishing, although I don’t live anywhere near a lake, a pond, a river or ocean. Maybe I will venture into fishing the next time I happen to be near water. However, I note that you have not pointed out which type of rods are suitable for each of these: lake, a river (depending on how big), a pond or dam and of course the ocean. Can they be the same? As for me the most likely place I might find myself near to could be a river or a dam. Lakes and oceans are not so easy to get to if one is just learning how to fish. If you’re just starting out I would go with the casting rod. This is a simple rod that can be used in lakes and rivers. If your fishing the ocean you would want to go with telescoping or surf rods.